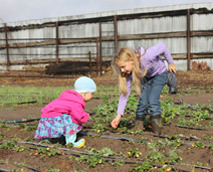 Amy's Farm is a fun and unique experience for all ages. From early childhood to senior citizens, we offer age-appropriate tours for all visitors. We have been offering tours for the past 18 years and have had all types of groups visit: school groups, scout groups, church groups, clubs, college classes, health clubs, families, friends... everyone! 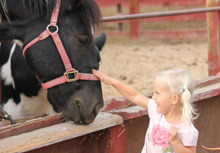 Enjoy a garden walk, smell fresh herbs, feed the pigs, visit the petting zoo, milk a cow and visit our horses. We can’t wait to meet you! Tour pricing varies from $8-$30 per person. In an age when our country is filled with large monoculture farms, it is important for our students to see and learn about a pttt of the circle of life. Animals help feed our plants with nutrient-rich fertilizer and in turn the plants provide food for humans and the animals that live on the farm. And in turn, the animals use the food we share with them to make healthy meat, milk, and eggs. 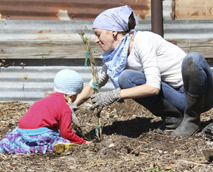 The farming practices of monoculture farms rob the soil of nutrients, necessitating the heavy use of chemical laden fertilizers and weed killers. Heavy pesticide use kills all insects and also wreaks havoc with the beneficial soil organisms and pollinators. At Amy's Farm, we farm organically, using no words ending in "cide". The students learn the importance of beneficial insects such as pollinators and predatory insects. 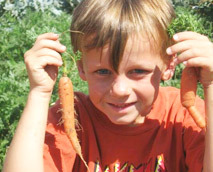 The students learn the importance of companion planting: Did you know that carrots love tomatoes? 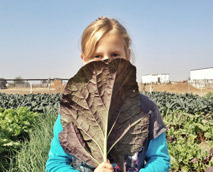 Most importantly, students will learn where their food comes from. They will see the carrots pull up from the soil, open a pod and see the peas all in a row, see the chickens laying their eggs, see the fruit on the trees, feel the wool on the sheep, see the cow's udder, observe the butterflies pollinating the blossoms, pick and smell fresh mint, rosemary, lemon verbena, etc. This tour is a very valuable learning experience for all who visit. Come and see for yourself!